Using the GPIO pins on the FT232H board is easy with the Python GPIO library that was installed. To demonstrate the usage I'll show a simple example of blinking an LED and reading a digital input. One LED of any color. A small resistor between ~330-1000 Ohms to limit current through the LED. LED cathode (shorter leg) to one leg of the resistor. Other resistor leg to FT232H GND. FT232H D7 to FT232H GND. This jumper wire will switch between reading a low value or high value on the D7 input by moving it between FT232H GND and 5V. With this configuration pin C0 will be a digital output that controls if the LED is on or off, depending on the level of the C0 output. Pin D7 will be a digital input that reads if it's at a high level (3-5 volts) or low level (ground). # Import standard Python time library. # Import GPIO and FT232H modules. 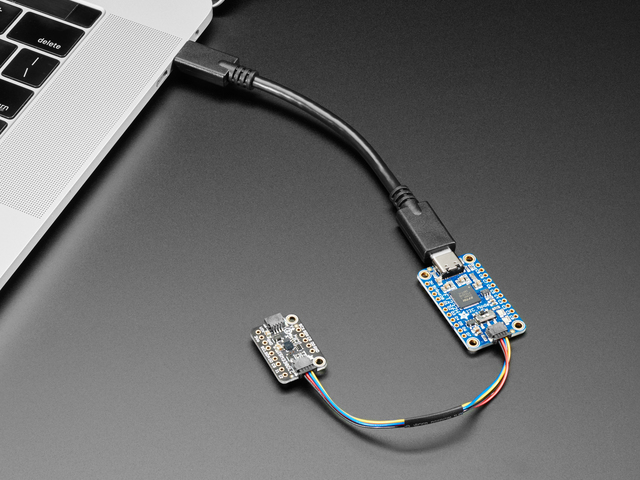 # Temporarily disable the built-in FTDI serial driver on Mac & Linux platforms. # Create an FT232H object that grabs the first available FT232H device found. # Configure digital inputs and outputs using the setup function. # Note that pin numbers 0 to 15 map to pins D0 to D7 then C0 to C7 on the board. ft232h.setup(7, GPIO.IN)   # Make pin D7 a digital input. ft232h.setup(8, GPIO.OUT)  # Make pin C0 a digital output. # Loop turning the LED on and off and reading the input state. # Set pin C0 to a high level so the LED turns on. # Sleep for 1 second. # Set pin C0 to a low level so the LED turns off. # Read the input on pin D7 and print out if it's high or low. Swap the jumper wire between ground and 5 volts to see the input value change. Let's look a little more closely at the code to understand how reading and writing digital GPIO works. First the required modules are loaded for this script. The time module will be used to delay for a short period of time. The Adafruit_GPIO and Adafruit_GPIO.FT232H modules will be imported with shorter names using the 'as' keyword. These modules have all the logic for reading and writing GPIO on the FT232H. Next the use_FT232H() function is called to temporarily disable any FTDI serial drivers. This command is necessary on Mac or Linux platforms because the libftdi library will interfere with the built-in FTDI serial drivers. You don't really need to run this command on Windows because the FTDI serial driver was disabled using the Zadig tool, however it can't hurt to call the function as it will do nothing on Windows. Now an FT232H object is created and assigned to the ft232h variable. This will detect the first available FT232H device connected to the computer and initialize its MPSSE for use with GPIO. Make sure the use_FT232H() function was previously called or else this function will fail! Next the setup() function is called on the FT232H object. This function takes two parameters, the first is the pin number and the second is either GPIO.IN or GPIO.OUT to set the pin as a digital input or output. Remember the pin numbers are 0 to 7 for D0 to D7, and 8 to 15 for C0 to C7. Now an infinite loop is entered and the LED is turned on and off using the output() function on the FT232H object. This function takes two parameters, the first is the pin number and the second is GPIO.HIGH/True to set the pin to a high level (3.3 volts), or GPIO.LOW/False to set the pin to a low level (ground). Finally the digital input is read using the input() function on the FT232H object. This function takes one parameter, the pin number to read. The function will return GPIO.LOW/False if the input is at a low level (below about 0.8 volts), and GPIO.HIGH/True if the input is at a high level (above about 0.8 volts, up to 5V max). That's all there is to use GPIO on the FT232H board! You can use these GPIO pins to turn on and off devices or LEDs, or read switches or pins from other chips. Be aware that the output pins on the FT232H are only designed to source a few milliamps of current (up to about 16mA per pin). If you need to drive devices that take a lot of current, look into using transistors to switch higher amounts of current. This guide was first published on Nov 12, 2014. It was last updated on Nov 12, 2014. This page (GPIO) was last updated on Apr 23, 2019.